Used to stop my little girl scratching her eczema. Gloves are perfect fit for my daughter she likes wearing them and also soft & comfortable for her. *** Very pleased with the product. Excellent thank you. I would recommend the product to people with kids. The gloves were good. Purchased these for my daughter to use at school when playing with items we know irritates her (paint, play doh, sand). She is dainty so needed the smaller size and they fit nice and snug allowing her to play 'normally'. Brilliant gloves we use them for our daughter who doesent have exema but has severe disability and the glove is only for her left hand to stop her scratching her face ,or neck because she hss sezuires. child finds gloves fit well and stand up to everyday wear and tear. Mum says they launder well. Price is good as well. Largest size ordered for my adult daughter. Fit fine. Nice quality glove with a good fit, used by my son for overnight moisturising. Half the price of others we have used. Quality of the gloves is lovely they are machine washable which helps. Excellent product bought for my grandson who has bad ezcema especially on his hands. He didn't mind wearing them in bed and this allowed him to have a thick layer of emollient on his hands that greatly improved his rough skin. He loved the fact they were just the right size for him . Gloves for toddler with skins problems. The gloves were bought for four year old grand daughter who has eczema. They are lovely and soft and we were very pleased with them but more importantly our granddaughter has taken to them and puts them on herself when she is feeling itchy. I bought these gloves for my 3 year old daughter who has chronic eczema on her hands which we couldn't get under control. We use these gloves when she goes to bed to keep the creams on her hands all night and she loves wearing them. Amazing, within 2 weeks the eczema was nearly gone without needing steroids. They fit well, wash really well and are reasonably priced, would definitely recommend to other parents. The gloves were very soft and hard wearing. If the child's hands are very sore I would recommend buying a size bigger. Never had a pair of gloves that fit so well and do exactly what they are supposed to do.Am so pleased with them I will be ordering five more pairs and have already told my friends and family just how good they are. The gloves were purchased for my son and although they are children's gloves, they fit me perfectly as I have small hands. 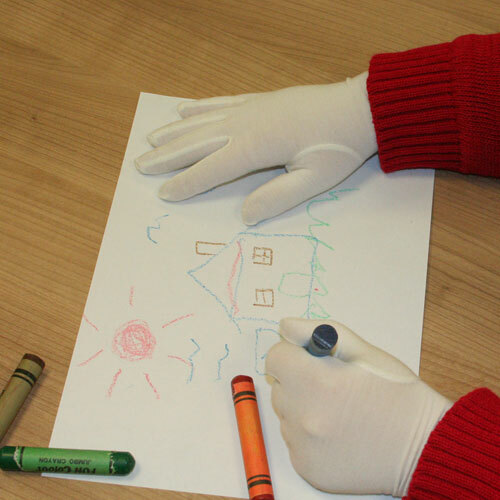 Gloves were comfortable and easy to wear - even at school. Quality of product 100% and perfect for my 3yrolds severe eczema on her hands. Would recommend to anyone who needs covering up. Good length for the wrists too . Very good gloves. My daughter finds very comfortable and keeps them on all night. Fit really well and cover wrists. These XL childrens gloves are a good fit for women. My granddaughter uses the gloves for bed time and wearing to school.